The Manzanita Trail connects Vincent Gap, just north of Mt. 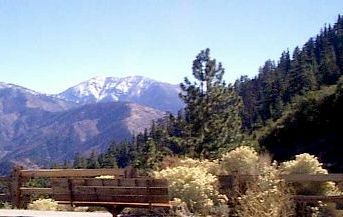 Baden-Powell, and South Fork Campground of Big Rock Creek in the northeastern San Gabriel Mountains. 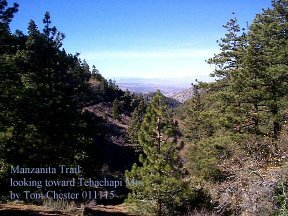 The trail is a section of the National High Desert Recreation Trail. The trail follows the trace of the Punchbowl Fault, and it is easy to see many of the prominent features of the fault. The trail accompanies the Blue Ridge from its very beginning to its maturity. The trail journeys through many vegetation zones and hence samples a wide variety of plant communities. The trail passes through some impressive tributary canyons to Big Rock Creek, including several with year-round water. One of the tributary canyons has experienced a catastrophic flood or landslide recently, perhaps in early 1998, which knocked down several large bigleaf maple trees. The trees currently are rebounding with vigorous new growth along the entire length of their trunks. There is a pretty seasonal waterfall along the trail. There are significant exposures of sedimentary rock formations, rare in the San Gabriel Mountains. The trail is one of the few to traverse Mt. Lewis. We don't know of any trail in the San Gabriels that showcases a fault as well as this trail. The linear trace of the fault is exceptionally easy to see since the trail travels along the fault and through four saddles created by the fault. Numerous exposures of fault gouge and slickensides show the trace of the fault itself, with easy-to-identify juxtapositions of quite different rock types brought together by the fault on either side. The plants along the trail change repeatedly from those of the desert to those of the mountains, depending on the elevation, location and exposure (southern or northern) of a given spot. The only detractions are few. The Vincent Gap end of the trail is at the Angeles Crest Highway. Hence at that end there are large pieces of trash (e.g., a mattress), massive drainage pipes carrying runoff from and above the Highway, and odd-appearing plumes of gravel and dirt and large rocks dumped from the Highway. These detractions end within the first mile of the trail, and the pipes and plumes are actually of some interest in seeing the processes of erosion at work. Maps: The trail is not shown on the USGS topo maps. The USGS 7.5' x 7.5' maps that cover this trail are Crystal Lake and Valyermo. The position of the trail on the topo maps can be roughly plotted from the information in the Detailed Trip Log below. The trail is shown on the Forest Service Angeles National Forest Map as part of the Desert National Recreation Trail. Trailheads and directions to trailheads: Vincent Gap (6,565') and South Fork Campground (~4,560'). A car shuttle between the two trailheads is 20 miles using the slow Big Pines Highway and SR2, taking about 45 minutes. Probably less time is needed using the dirt Big Rock Creek Truck Trail (4N11) if it is passable by your vehicle. Length: 5.2 miles according to the map at Vincent Gap, although we suspect the trail is actually somewhat longer. Measurements from Topo! give a minimum length of 5.5 miles, supported by TJC's pedometer measurements and from descriptions about where the dangerous area is (see below). If some mountain bikers have recorded the length measured by their odometers, please email us. Elevation Changes: The trail gains ~2,400' and loses ~400' of elevation from South Fork Campground to Vincent Gap, for a net altitude gain of 2,000'. Trail Condition: The trail is in excellent shape as of July 2001. Trail Maintenance: Trail has been adopted by Antelope Valley Trails, Recreation and Environmental Council (AVTREC). History: In November 1999, a short section about 2 miles up from South Fork Campground and 4 miles down from Vincent Gap was in bad shape. That section consists of unstable gravel scree which was severely washed out with a very steep drop-off below the "trail". Even the stakes placed there to hold the slope were are crazy angles or found downslope. That section was passable only by brave, fearless types, since we saw a biker carry his bike over that section on 11/15/99. However, that section appeared too dangerous for us to cross it comfortably, and hence we turned around at that point, and bypassed that section by taking a slight detour to Big Rock Creek Camp (see below). In 1997, AVTREC was working with the Forest Service to try to reroute this section of trail, but as of late 1999 it had not been done. On 6/15/01, the Manzanita Trail was posted as Unsafe for Horses. Fortunately, after a lot of volunteer work, this posting was removed by 7/20/01. As of 7/20/01, the entire trail is now in better shape than it has been in years. This description begins at Vincent Gap, and derives from a hike on 15 November 1999. The trail begins on the north side of the Angeles Crest Highway (SR2), heading northwest from a map display of this trail and other trails in the vicinity. Don't confuse the trail with two dirt roads that head north from that spot, Big Rock Creek Road and one heading up the Blue Ridge. 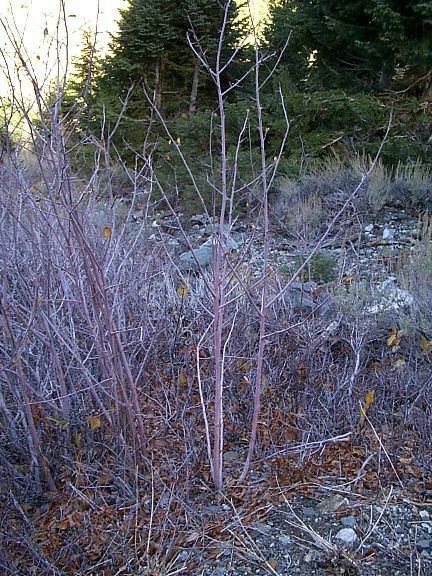 A hot, dry environment like that of the high desert marked by plants like scalebroom. A wet, cooler stream environment with a rich riparian woodland, marked by white alder and bigleaf maple that demand constant water for their roots. 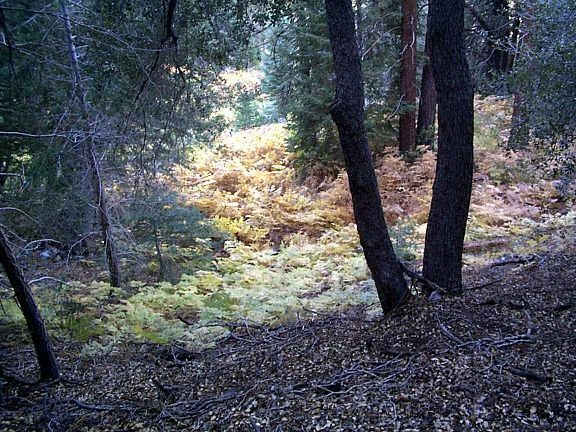 An upper montane forest community similar to that of the San Bernardinos marked by bracken ferns and a variety of berry bushes. The well-established and unburned San Gabriel Mountain communities of yellow pine forest and of chaparral. 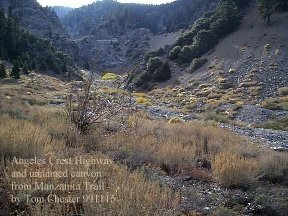 See Generalized Vegetation Transect Of The Manzanita Trail. Vincent Gap is formed by the Punchbowl Fault, which is thought to be a former strand of the San Andreas Fault and no longer active. There are good exposures of red fault gouge produced from sedimentary rocks that are present only in a narrow band next to the fault. Note the contrast between the gray-green Blue Ridge rocks to the north, the red fault gouge on the fault, and the granitic rocks to the south. This contrast will be seen repeatedly along the trail. The trail plays tag with the fault, hitting the fault at saddles, and then diverging south from the fault between the saddles. An Adopt-A-Trail marker on the left says that AVTREC has adopted the next 5.2 miles of trail. The first part of the trail is dominated by its nearness to SR2. A few large pieces of trash (e.g., a mattress) are in the streambed. Massive drainage pipes are above ground and heavily buttressed above and below the trail, and buried as they cross the trail. Although the pipes were designed to prevent erosion below SR2 from the road runoff and the runoff above the road, the pipes nonetheless cause erosion in their vicinity due to rainfall running off and alongside the pipes. Fortunately, these pipes extend all the way to the canyon bottom, reducing the heavy erosion that would have occurred at the ends of the pipes if they ended higher. Several odd-appearing plumes of gravel and dirt also come off the Highway. The plumes are perhaps 6' wide and fairly uniform all the way down the canyon. They have a depression in the middle as if a small stream flowed there. We don't understand the origin of these plumes, since a dump of such material off the edge of the Highway would surely be wider at the top than at the bottom, as well as having a ridge in the middle rather than a depression. Perhaps this is cover material for a buried pipe. Finally, erratic large rocks cleared from the Highway are ubiquitous here. Rockfalls on SR2 are frequent occurrences, and must be swept off the Highway and dumped somewhere. This would not be an especially good place to be when the maintenance trucks come by! Within about a half mile, these features disappear as SR2 gets farther from the trail. The trail also gets farther from the fault, which won't reappear again at the trail until mile 2.1. At 0.9 mile, the trail enters the first major tributary canyon from the south. Views of SR2 and the canyon above are magnificent. The canyon between SR2 and the trail appears unusually wide, especially on the east, which can be seen in the topographic contours as well. We wonder if a landslide was responsible for this unusual width. In fact, the canyon has clearly experienced a recent flood or landslide, probably due to the heavy rains of early 1998. At least three large (> 40') bigleaf maples are now fully horizontal, pointing down canyon. There are many ~4' sprouts all along the trunk that are probably only a year or two old. Apparently roots on the down canyon side of the tree survived the toppling of the tree. In the next 0.7 mile, the trail crosses two side canyons with water. The first canyon has a pleasant ~15' waterfall over a wire retaining cage of rocks that preserves the trail in the streambed. The trail heads back toward the fault, and at mile 2.1, near a saddle, the trail makes a single switchback into the fault trace itself. The red fault gouge is beautifully displayed here, with contrasting rocks on either side. The trail then again diverges south from the fault. At mile 2.6, the trail enters Dorr Canyon, just at the point where the Canyon transitions from a normal steep higher elevation canyon to a flatter open "wash". SR2 is over 1.5 miles away, and cannot be seen due to the meandering of Dorr Canyon. 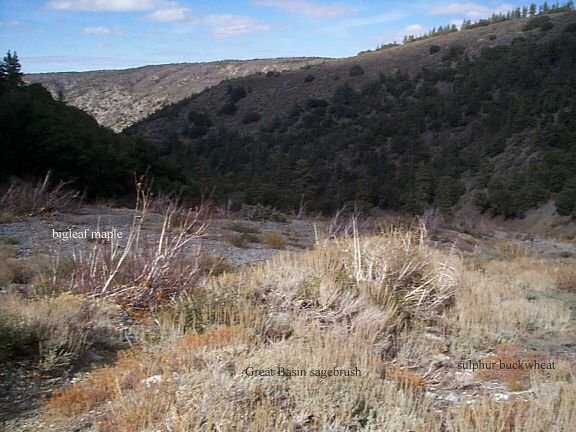 The trail again heads back toward the fault and reaches it at mile 3.2 at the saddle after Dorr Canyon. The trail again heads south away from the fault and at mile 3.7 reaches the bottom of the next canyon. As you leave that canyon, look back behind you to see an impressive seasonal waterfall higher in the canyon. The waterfall is where the topographic contours are smushed together around 5,900', ~500' above you. The waterfall consists of at least 2-3 tiers, and are at least 30' high and possibly significantly more. Two side trails head steeply up the canyon to the south that we presume lead one on a scramble to the waterfall. At 3.9 miles you reach a high point on the trail and the junction of the trail to Big Rock Creek Camp, signed "B.R.C.C." at the junction. If the trail ahead becomes washed out again, go right at that junction to B.R.C.C. Manzanita Route to South Fork Campground. At 4.6 miles you reach the unstable section of the Manzanita Trail, and you reach South Fork Campground at ~5.5 miles. B.R.C.C. Route to South Fork Campground. The trail to B.R.C.C. is very steep, but poses no real problem. It switchbacks down the ridge heading toward the road to the prominent water tank. At 4.5 miles you reach that road and turn left, downhill, toward B.R.C.C. At 4.9 miles you reach the end of the road, turn left for two blocks, then turn right at the T-intersection to reach the entrance to B.R.C.C. Just before the crossing of Big Rock Creek, the trail to South Fork Campground heads west immediately on the north side of the horse corrals. The trail heads gently uphill to the fourth saddle created by the Punchbowl Fault at mile 5.6. The Manzanita Trail is met again just beyond the saddle, as well as another trail shown on the topo map as ending rather quickly. Another 0.8 miles brings you to the parking lot for the Manzanita Trailhead at South Fork Campground. This log gives the mileage and time to features along the trail from Vincent Gap, along with their altitude, from a hike on 15 November 1999. The mileage is from TJC's pedometer reading, adjusted by multiplying by 7/8 to match overall the mileages derived from Topo!. After adjustment, the mileages typically agreed to within 0.1 mile at each point. The mileages are thus probably accurate only to 0.1 mile, but are given to 0.01 mile to prevent adding rounding errors. Times are from the start of the hike. Your times may be shorter since Jane and Tom spent a lot of time looking at the plants, views, and fault exposures along the way, and trying to estimate waterfall heights. The altitudes are from the topo map, for features that could clearly be identified there, and from TJC's adjusted altimeter reading for other locations. 0 0.00 0:00 6565 Vincent Gap. 2 1.37 1:20 6250 First of two side canyons. ~15' waterfall over basket of rocks in streambed. 3 1.58 1:35 6250 Second of two side canyons. 4 2.10 1:55 6000 Beautiful red fault gouge. 5 2.64 2:15 5580 Dorr Canyon. 7 3.67 3:06 5350 Next side canyon bottom. Jct. trail up to waterfall? >30' fall, 2-3 tier, with another above. 9 3.94 3:24 5450 Jct. Trail to BRCC Right. 10 4.45 3:43 4960 Jct. road to water tank. Left, away from water tank. 11 4.89 3:59 4680 Entrance Big Rock Creek Camp. 12 5.59 4:31 4900 Jct. Manzanita Trail. Right. 13 6.38 4:56 4560 South Fork Campground Trailhead parking. View of Mt. Baldy from Vincent Gap, 15Nov01. View of Devils Punchbowl, Mojave Desert and Tehachapi Mountains from near the top of the trail, 15Nov01. View of lower part of the first side canyon at mile 0.86, 15Nov99. View of upper part of the first side canyon at mile 0.86, 15Nov99. Lavender stems of Serviceberry, 15Nov01. Brackenfern fall color near mile 1.3, 15Nov01. When available, the date of the information is given in parentheses for each link. This also contains geologic maps of the entire Punchbowl Fault, showing the distribution of rock types along the Manzanita Trail.